I felt it necessary at this time to revisit the issue of "the rapture of the church" but before I get into this, may I suggest to you, the reader, to review a posting on FROM the MIND of FIRE? Check out the article As Weird As Rain. Once completed, then come back and read this article. Due to its rather large size, this article "RAPTURE: The WHO and WHEN Of It All" will be done in six installments. It would seem that God deals with Israel and the church mutually exclusively; that each has a specific calling and destiny that differs from one another. Certainly the very idea that the church has replaced Israel is heresy, and a blatant twisting of scriptural truth. This is known as "Replacement Theology" and you may not be aware that this false doctrine was very prevalent during pre-Nazi Germany churches, and was a major factor in the persecution of the Jews. For a perspective on this, I recommend "On The Road To Holocaust" by Hal Lindsay. When the LORD was dealing with Israel, starting with Abram aka Abraham, back in GENESIS 12, and through his lineage with Isaac, Jacob, then the twelve patriarchs, it culminated with, first - the prophetic scriptures that revealed the Messiah; and second - when He would appear to inaugurate what's known in the New Testament as "the kingdom of heaven" which in itself involves the Davidic Covenant, and what we now know as the Millennium. Something one should be aware of is that "the kingdom of heaven" in Hebrew would be more accurately rendered "the kingdom from heaven". In regards to Christ physically reigning on this Earth, His royal throne being established in Israel, in Jerusalem, there are those who would refute this notion, saying that Jesus declared in JOHN ch. 18, "my kingdom is not of this world". Again, the Hebrew word for "of" can also be rendered "from" and that puts a whole different spin on this statement made by our Lord! The latter portion of this verse clarifies this even more: note the part that's in italics! Note here that Jesus declares that they (the disciples) are not OF THE WORLD, even as He is not of this world! Yet both the LORD Jesus and these twelve lived, and dwelt on this planet; the LORD Jesus for thirty three years, the disciples obviously for the entirety of their lives! Simply because they were "not of this world" didn't mean that they didn't dwell in this world! As the LORD came to present Himself to Israel, His dealings with the Gentiles was scant, and only occasionally to specific persons did He have any interaction. He said as much to His disciples in: MATT 10:5-23 and remember what He had to say to a Syrophoenecian woman in MATT 15:21-28. Bear in mind that the religious establishment, the Jewish Sanhedrin, the Pharisee's, and Sadducee's, scribes and lawyers of the Torah were familiar with Messianic passages, but focused on the ones that spoke of Messiah as a warrior (the Old Testament refers to Him in this capacity as "The Avenger of Blood"), who would deliver Israel from the oppression of her enemies. In this case, the Roman Empire! When Jesus began speaking of "loving your enemies" and "turn the other cheek" and "I am come to seek and to save the lost", He didn't fit their agenda or their desire for a warrior Messiah, thus He was rejected, even though He gave them signs that were specifically Messianic! The word for 'dumb' in Hebrew is illem meaning "speechless" and is based on the root word alam which means "to tie fast, dumb", this is a verb form, thus implies an action taken: it can mean "to put to silence". Some render the meaning of such a "dumb" person as one possessed by a demon that afflicts the victim with the inability of speech. Jewish exorcists would demand the demon name itself so that it could be cast out, and this is even a practice that Jesus used once (refer to "Legion" who possessed the Gadarene man in MARK 5:1-16. Yet with such a one who was dumb, it was impossible for the Jewish exorcists to cast the demons out, for they couldn't learn its name; but it was believed that the Messiah would do so, and that this would be a sign of His arrival. Thus when we see in MATT 12:22-37 once the demon was cast out, the people wondered and asked if indeed this was "the son of David" that is, the Messiah. Yet the Pharisees disputed this claim and said that Jesus was doing this in the power of Satan; Jesus warned them that blasphemy of the Holy Spirit would not be forgiven, either in this world or the next! He answered and said unto them, Because it is given unto you to know the mysteries of the kingdom of heaven, but to them it is not given. For whosoever hath, to him shall be given, and he shall have more abundance: but whosoever hath not, from him shall be taken away even that he hath. By hearing ye shall hear, and shall not understand; and seeing ye shall see, and shall not perceive: For this people's heart is waxed gross, and their ears are dull of hearing, and their eyes they have closed; lest at any time they should see with their eyes, and hear with their ears, and should understand with their heart, and should be converted, and I should heal them. Thus we understand that because the Jews were rejecting their Messiah by attempting to refute His Messianic claims and signs, judgment was falling upon them, and only those who genuinely sought after Truth would perceive the meaning of the parables. Those who had "an agenda for the Messiah" such as the Sanhedrin or even Judas Iscariot would become blind to the Truth. Most Jews didn't see, hear or understand His Word and so weren't converted, nor were they healed. Yet those who did receive the Truth of the LORD's Words understood, and received greater and deeper Truth! The LORD Jesus then lambastes the Pharisees and scribes, condemning their actions and conduct, for in effect, they not only were rejecting the kingdom of heaven, but were prohibiting others from entering in as well! Wherefore, behold, I send unto you prophets, and wise men, and scribes: and some of them ye shall kill and crucify; and some of them shall ye scourge in your synagogues, and persecute them from city to city: That upon you may come all the righteous blood shed upon the earth, from the blood of righteous Abel unto the blood of Zacharias son of Barachias, whom ye slew between the temple and the altar. Verily I say unto you, All these things shall come upon this generation. O Jerusalem, Jerusalem, thou that killest the prophets, and stonest them which are sent unto thee, how often would I have gathered thy children together, even as a hen gathereth her chickens under her wings, and ye would not! Behold, your house is left unto you desolate. For I say unto you, Ye shall not see me henceforth, till ye shall say, Blessed is he that cometh in the name of the Lord. 41 And when he was come near, he beheld the city, and wept over it, 42 Saying, If thou hadst known, even thou, at least in this thy day, the things which belong unto thy peace! but now they are hid from thine eyes. 43 For the days shall come upon thee, that thine enemies shall cast a trench about thee, and compass thee round, and keep thee in on every side, 44 And shall lay thee even with the ground, and thy children within thee; and they shall not leave in thee one stone upon another; because thou knewest not the time of thy visitation. More on this extremely important passage in a little bit. This blindness is by no means permanent, but will last for a certain period of time, after which it shall be lifted. THY KINGDOM COME -- For Who? And also: MATT 22:1-14, esp. vs. 8-10 and the great commission in which the LORD commands His own to . . .
Of course 1 PETER 2:9 agrees with this, declaring that we, the church are "a chosen generation, a holy nation, a peculiar people . . . "
The LORD is even now working as He did from the beginning, with the church, saving souls and adding to the church such as should be saved (ACTS 2:47). Does this mean that God recognizes only this "holy nation" that is the church, and no longer recognizes Israel? Absolutely not! As we have stated before, Replacement Theology is heresy! When shall this church be complete? When will our Father look down upon the Body of Christ, and according to His foreknowledge, see that the last soul He intends to become a member of the church has come to salvation? Only He knows! However when this day arrives, what the Bible speaks of as "the fulness of the Gentiles" (ROM 11:25), that's when Israel will once again be dealt with by God, and He shall open their eyes to the Truth that they had rejected so long ago. Speaking of fullness, this is the end of this segment as the material involved in this article is extensive. We will probably have between four to six segments running for this article in its entirety. While I may seem to be meandering in this article, every facet supports a central point, so I would solicit your kind patience and have you wait to the very end to come to your own conclusions. In the meanwhile, may the LORD Jesus bless you all, as we await Him who is to come; our BLESSED HOPE! 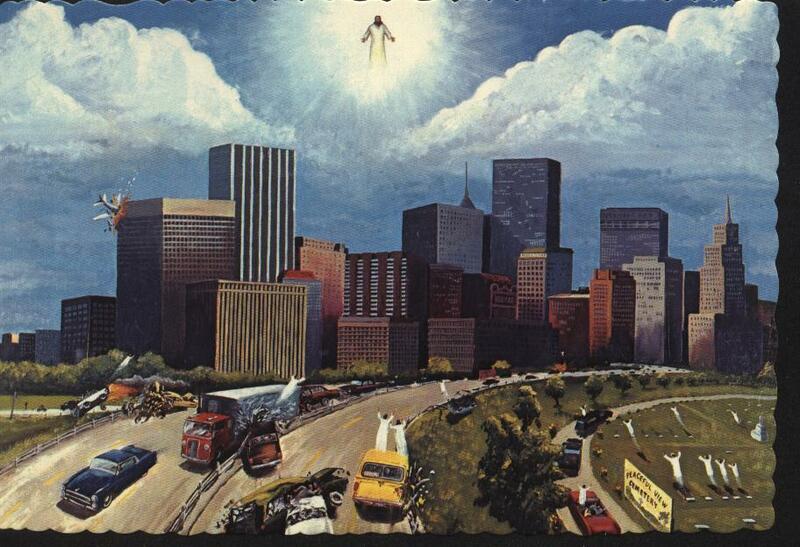 what happens BEFORE the rapture? There are no prophetic events, occurance or signs requisite prior to the rapture of the church h. It is an event that may happen at any time without warning; hence the LORD's admoniton "to be ready always, for you know not the hour of His return". All signs of Christ's return to Earth are in regards to His Second Coming, not the rapture of the church - a separate event.